Dombi Heruka (Skt. Ḍombi Heruka; Tib. ཌོམ་བི་ཧེ་རུ་ཀ་) or Dombipa (Skt. Ḍombipa) was one of the eighty-four mahasiddhas and student of Virupa. 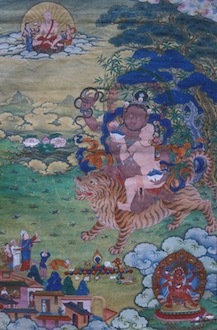 He is usually depicted riding a tiger and holding a snake. This page was last edited on 11 June 2018, at 16:55.